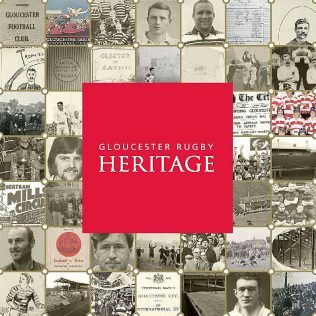 You are here: HomenextDocumentsnextBooksnextGloucester Rugby Heritage - The Book. The book “Gloucester Rugby Heritage”, available at the Club shop and at the Quays, celebrates and shares the story of Gloucester Rugby using material from the Club’s archive and is illustrated with many contemporary photographs, sketches and newspaper cuttings. Gloucester Rugby is part of the fabric of the City itself and from rather exclusive middle class beginnings in 1873, it soon became the people’s club that it is today. The Kingsholm ground, which was first opened in 1891 following the purchase of 7 acres of the Castle Grim estate, is famous worldwide. The book attempts to capture something of the special place that the club holds in the city, the stories, the characters and the landmark matches. What is the true story of the famous Cherry and White strip? What happened when the circus came to town? Star players of each era are highlighted and a selected few Gloucester Greats are featured. Controversial? Almost certainly, but it wouldn’t be a book about Gloucester Rugby if it didn’t provoke a few arguments.